It's not as if there has been concrete progress towards resolving the issue of North Korea's nuclear and missile development. The international community must not loosen the net encircling North Korea both militarily and economically. South Korea and North Korea held a ministerial-level meeting and agreed that the two countries will cooperate to ensure the success of the Pyeongchang Winter Olympics in South Korea next month. North Korea will send a delegation consisting of athletes, high-ranking officials and a cheering squad, while South Korea will provide necessary services. The accords also include the holding of talks on reducing tension, to be attended by officials. North Korea has reportedly notified South Korea of its restoration of a military communication line with South Korea. It is important to reduce the danger of accidental conflict. Emphasising the shared ethnicity of the two countries, both also agreed on a policy of continuing senior official-level meetings. It can be considered that Mr Kim Jong Un, chairman of the Workers' Party of Korea, has put into full gear a strategy of winning over South Korea by playing its "Olympic participation" card. It was the first formal talks in almost two years between the two Koreas. Without a doubt, North Korea is aiming at driving a wedge between the United States and South Korea, by appealing to the idea of reconciliation between the two Koreas. Sanctions on North Korea, such as trade restrictions on refined petroleum products, have had an effect. Pyongyang may also ask Seoul for economic cooperation and for a relaxation of sanctions in the inter-Korean meetings in the days ahead. Something to be wary of is the fact that when the South Korean side proposed holding talks with regard to the denuclearisation of North Korea, a representative of the North Korean side rejected it flatly. There would be no change in the fact that Pyongyang is steadily advancing its nuclear and missile development programmes, even if the country refrains from conducting a nuclear test or launching a ballistic missile until after the Pyeongchang Olympics and Paralympics end. There is strong concern among countries, including Japan and the US, over the possibility of the Moon administration making excessive concessions to Pyongyang in its haste to improve relations. It is vital for South Korea to maintain close cooperation with Japan and the US with regard to policy towards North Korea. It certainly is a good sign that the two Koreas agreed on North Korea's participation in the Pyeongchang Winter Olympics. But the sudden eruption of a reconciliatory mood should not interfere with the ultimate, unalterable goal of denuclearising the North. As things stand, the first inter-Korean government-level talks in over two years yielded more-than-expected results. Besides athletes and team officials, the North will send what is expected to be the largest delegation of its kind to the Pyeongchang Olympics. 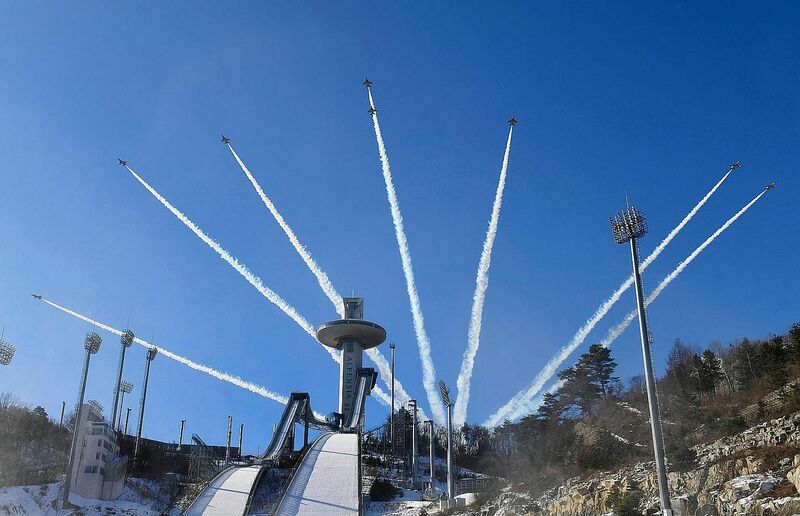 The two sides also said they would consider a joint march of their athletes during the opening and closing ceremonies of the Games in Pyeongchang, Gangwon province, on Feb 9. All these are a great boon for the Olympic Games, which had faced security concerns. What cannot be ruled out is the possibility that the North is merely using the thaw in inter-Korean relations to buy time to further improve its nuclear and missile capabilities and discourage the United States from taking new hard-line actions, including possible military action or harsher economic and diplomatic pressure, like the cutting off of oil supplies and naval interdiction or embargo. Its decision to send such a large delegation to Pyeongchang and the agreement to hold military talks aimed at discussing the reduction of tensions along the heavily fortified border between the two Koreas and other high-level government talks could be part of efforts to maximise the effect of its peace overture. There is no reason not to take advantage of the change in the North's position. But the South Korean government and the international community should not lower their guard as long as denuclearisation is concerned. Visuals of the North and South Korean delegation leaders greeting each other at the demilitarised zone of Panmunjom do testify to a measure of de-escalation after the volley and thunder of recent ICBM (intercontinental ballistic missile) tests. Having said that, it would be presumptuous to imagine that the worst is over. Not really; there is little doubt that the North will be under renewed pressure in the event of the next stand-off. For now, through a deft diplomatic gambit, Mr Kim Jong Un seems agreeable to the North's participation in next month's Winter Olympics in the South. After frequent bouts of defiant muscle-flexing, Pyongyang is seemingly anxious to be recognised by the comity of nations, thus shedding its pariah image for which it has only itself to blame. There is a degree of symbolic significance too in the North's participation in the Games, and it is pretty obvious that President Kim has played to both the domestic and international gallery. Yet, a degree of cynicism is bound to persist, in the context of previous crises. There is no entente cordiale quite yet. And central to the war of nerves must be North Korea's spectacular progress in its weapons programme. The nature of contemporary geostrategy would suggest that denuclearisation is unlikely. Ergo, the rational course of action is a nuclear freeze, an issue that was somehow skirted at the recent conference, riveted as it was to the Winter Olympics. It is good that the talks between the two Koreas on Tuesday at the border truce village of Panmunjom appeared amicable and constructive. And the unusual, if not unprecedented, suggestion by Mr Ri Son Gwon, the chief delegate of the Democratic People's Republic of Korea, that the talks be "open and transparent" and their content be made public "in light of the great expectations and huge interest both here and abroad" and to demonstrate its "sincerity and endeavours" was, itself, something of a break with the past. If things go well, looking forward at the best-case scenario, the latest rapport might extend further, towards a longer-lasting thaw in inter-Korea relations. However, as history has repeatedly proved, inter-Korea ties are too fickle to support unbounded optimism. While tensions between Seoul and Pyongyang may be assuaged, at least for the time being, the dangerous situation on the Korean Peninsula has not suddenly dissipated. Nerves have yet to calm since North Korean leader Kim Jong Un warned in his annual New Year address that he has a nuclear button "on my desk at all times" and United States President Donald Trump responded with typical bluster, tweeting that his button was "much bigger and more powerful". Fortunately for all of us, while Mr Trump was prattling on about a "free world united against evil North Korea", Pyongyang extended an olive branch to Seoul. South Korean President Moon Jae In, who has always supported dialogue with the North, called the gesture "an epoch-making opportunity to improve inter-Korean relations and establish peace". Mr Trump needs to understand that this issue is not about him, nor is it solely about Americans' security. It is also about the fate of one of the world's most reclusive regimes, whose leader, derided as "crazy fat kid" by cruel American lawmakers, has just schooled the leader of the free world. Most observers agree that Mr Kim reaching out to the South is a strategy aimed at changing the narrative now that he possesses nuclear weapons and might be able to deliver them to the continental US. If this is not the case, Mr Kim could get back to his tests and threats once the Olympics are over, and South Korea and the US resume their regular military exercises. But, for the time being at least, Mr Kim has given the world some breathing space and the hope of a chance to discuss the nuclear problem rationally. • The View From Asia is a compilation of articles from The Straits Times' media partner, Asia News Network, a grouping of 23 news media.